This morning we ordered breakfast in our room again so we could get to the mandatory immigration check at 8am. We were ready, but immigration wasn't. The ship pulled into dock in Hobart an hour late. Once the Australian immigration officers were on board, they called passengers by scheduled tour. We were on one of the first tours scheduled for the day, so we got in to see immigration in the first group. Our tour began with a bus tour around the port city of Hobart. We rode past some of the most expensive homes in the city, as well as the oldest and most respected schools. From there we rode out to visit a small town called Richmond. 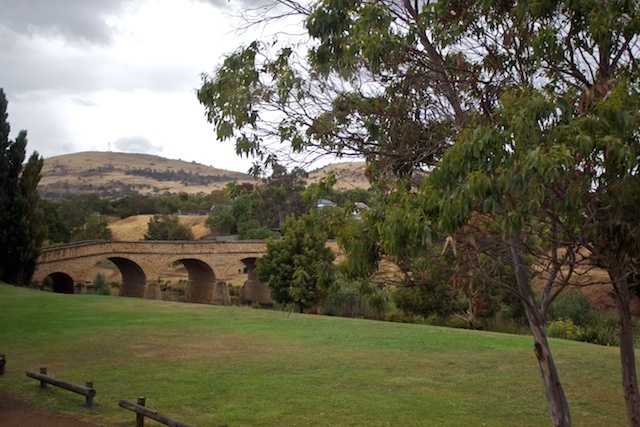 The majority of the buildings in this town date to the original colonization of Tasmania. This is a nice little town and we would have enjoyed it a lot more if it hadn't been raining on and off for the hour we were there. Our next stop was much more interesting. We spent an hour at the Bonorong Park Wildlife Center. 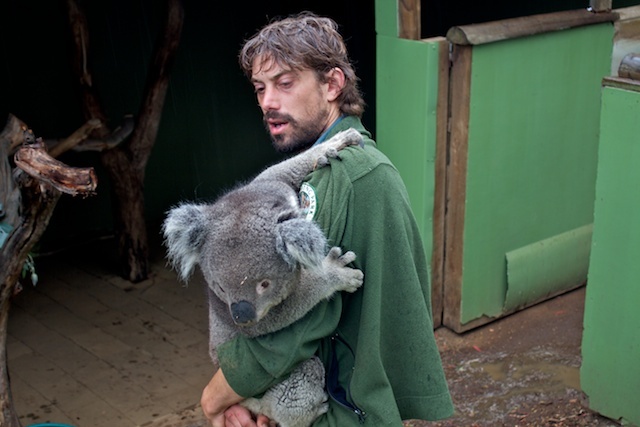 This is a wild animal rescue center where they care for injured and orphaned wildlife such as kangaroos, wallabies, Tasmanian devils, wombats, quolls, and a large variety of birds. There were kangaroos hopping all over the park. 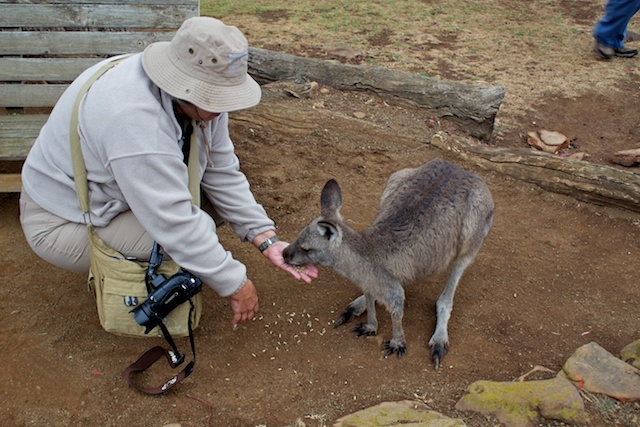 Buckets of kangaroo feed were placed around the park and a guide explained how to feed them and that they enjoyed having their chests rubbed. They were very friendly, following us around looking for food. As you can see here, I stopped and fed a little one. Guides were stationed around the park, explaining the different animals. 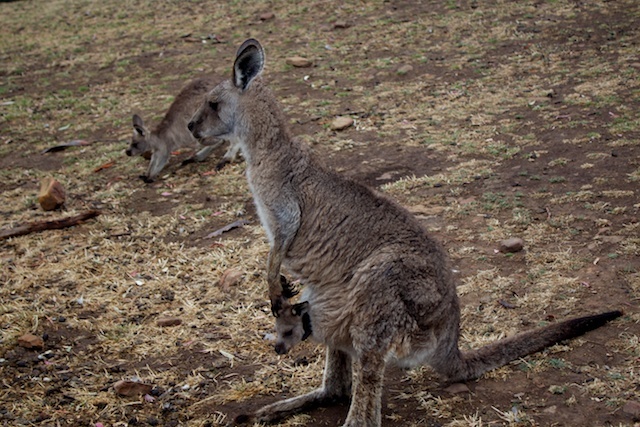 I got some great video of lots of kangaroos, some very active koalas, Tasmanian devils, and some baby wombats. They were a joy to watch and learn about. 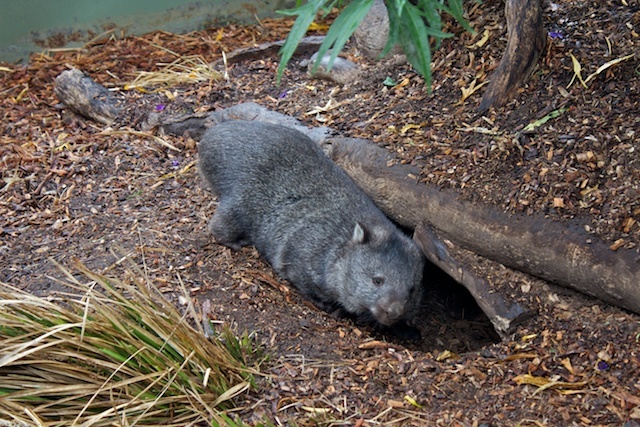 The wombats were very shy, retreating into burrows and tree trunks to get out of the rain, but Ray managed a picture of this one. 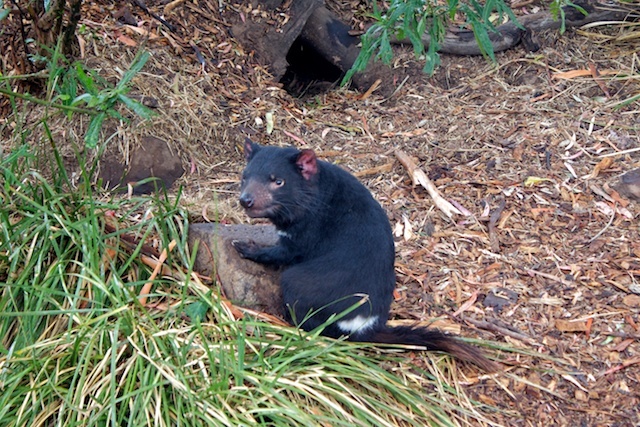 There were 3 very active Tasmanian Devils that I got some great video of. Ray took this shot of the male. For our friends who like the more active types of tours (talking to you Christie), some of our shipmates took a bicycle ride down from the top of Mount Wellington, just outside of Hobart. They told us the view was fantastic. We really enjoyed the wildlife tour. We could have easily spent more time at this port.